I have spent a lot of time traveling in and around Sumy. 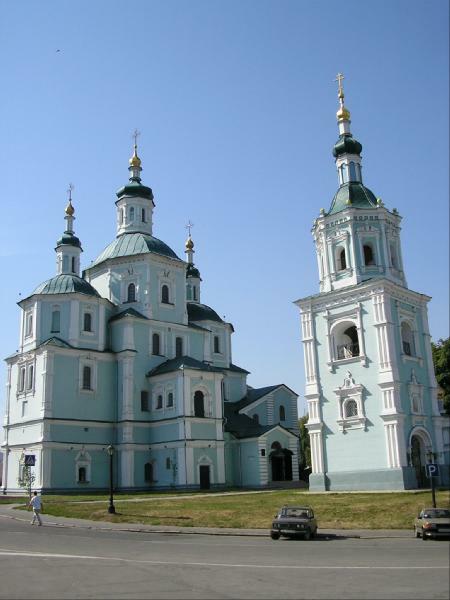 It is located in western Ukraine about four and a half hours from Kiev. I have quite a few friends and some family in and around Sumy. I have some great memory's going to visit friends in the villages around Sumy. I have spent a few evening at Fonconi, one of my favorite places to dine. the food is quite good and prices are reasonable. For a quick bit I normally stop at New York street piza, there pizza is not bad and there salads are quite good. To get to New York street pizza stand in front of the Eco market in the center of town and go up the hill to the street lite, Turn Right go about 3 block its on the right side. If you want to go to Fonconi go down the street where New York street Pizza is, turn right go 2 blocks its on the left. There is a Mc Donald's across the street from the Eco market. all these places offer menus in English except the pizza. Let me first start by saying Merry Christmas to all. I spent about 4 years in the dating scene in Ukraine. I tried all the methods, some just for some insight into how it works. No method or style can be deemed bad depending on personal preference. Dating is basically an American term and not really used in Europe, that's not to say they don't know the word or meaning. We here at easyukraine have a wide range of dating agency's for comparison. Since our site is basically about Ukraine we have chosen the top dating sites for you. As affiliates we do make money from commission sales of these agency's. We have both pay per letter and direct contact sites as affiliates. Pay per letter seems to have more scammers as a general rule, that's not to say all of them are scammers. They do have one upside in that you deal with a local agency when you arrive to see your special friend. This can be a bad thing since you might wind up over paying but, you have access to there database if things don't work out. This method seems to be preferred by people who are novice at traveling abroad. Just remember to ask what the cost is before you go to see your new found friend. We do have a few trusted people listed on our links page. Next we have direct contact sites. It is just like any other internet dating site, you get direct contact with the person of interest. Most are free to place a profile but have a membership fee. This method is used more by those who are familiar with foreign travel and don't mind doing it themselves, since it only takes a few searches on the web to find what you need in Ukraine. Sumy Ukraine has quite a few nice places to eat with all sorts of food . You can have traditional Ukrainian food , pizza, Italian, Egyptian, sushi and plenty of potatoes. Potatoes and salad are a large part of the local staple for food as well as borsch. Salad is mostly made with mayonnaise but a few are made with oil. Potatoes are cooked every way imaginable fried mashed in soup or salad. Mushrooms are also quite popular in salad and soup. You can also have pancake stuffed with what ever you like such as chicken, fish and mushroom., the pancakes in Ukraine look and taste like a crepe. Here are a few pictures from Fonconi an excellent Italian style restaurant with a nice atmosphere. Now is when you find some of the best prices for flights to Ukraine. I normally take a trip to Ukraine in the fall around the first of October and then again in February. In October the temperature can get a bit cold in Ukraine and even snow on occasion, I still find during the day a walk along Khrashatic in Kiev can be quite enjoyable. In February I like to do some snowboarding so Bukovel is on the list of must see in Ukraine. If you can speak some Russian of have a friend who can, finding a great deal on accommodation is a snap. My wife is Ukrainian so we have no problems finding a great rate for a hotel when we go to the Carpathian mountains. An apartment in Kyiv can still be difficult to find at a decent price but I use some of the places on my links page to make the arrangements. If its your first trip to Ukraine I recommend using one of the company's on our links page to save some trouble and make your trip worry free. I only list places and services me or my staff use, we do not receive commission or discounts from the services listed on our links page allowing us to only list those who do and offer what they advertise. I have traveled all over Europe mostly by air but I find train travel is the most relaxing for me. I find train travel is best and economical for most destinations in Ukraine. The rail system is quite extensive there is 22,800 km of track in Ukraine. I have spent as much as 50 dollars to buy the whole berth in second class, it consists of 4 bunks and a door that closes for sleeping along with a small table for eating. Longer trips will have a dining car but for most train rides they have hot water for free and you can purchase tea, coffee and sweets. It is common to share food with others while on the train, we normally stop at the local market for bread, cheese, sausage and something to drink for our journey. In the summer when the train stops at some of the small villages you can purchase fruit and an assortment of dried fish or baked goods. since most trains schedules are set to depart in the evening you arrive in the morning. It is a good idea to take your own toilet paper since there might not be any. As a precaution keep your valuables on you when you travel. A word of caution if you are traveling from smaller city's you might be spending a considerable amount of time on the train. On a trip to Crimea the scenery was fantastic and we had a great time arriving at 5AM was not the best part. On another trip to Bokovel we spent 24 hours on the train because we left from Sumy and not Kiev. Buying tickets can be a problem unless you speak Russian or Ukrainian so plan accordingly. Most hotels and company's who offer translators can make the arrangements for you in advance. If you do not book in advance you might not get a second class ticket. There is a web site for train tickets in Russian but I'm not sure how reliable it is. As Euro 2012 preparations are being finalized in Ukraine I am thinking of snowboarding in the Carpathian mountains. First it seems Lvov will be ready with the new stadium as well as a number of hotels going up in Kyiv. the plans for a new welcome center close to the stadium is well under way and will be completed in time for the tournament. Soon the new symbols that were approved by FIFA will start to appear in all the city's hosting the tournaments. In the fall is the best time to get a great deal on a flight to Ukraine. The summer crowds have gone from from Crimea and the beaches are almost empty in Odessa. It is a great time of year with the trees changing color and the cool evenings make it a great time to spend with a special some one. For tourists in Kiev there are some incredible views of the country side from all over the city. What seems to be growing in popularity is what is called pub crawls where, for a fee you board a double deck buss and visit some of the local drinking establishments. They come complete with translator so ordering a few drinks is not a problem. Free tours Kiev has some information for those interested(look them up on facebook). I am a fan of there business model offering free walking tours of Kiev along with there other paid services including excursions around Kyiv. Euro 2012 stadium open in Kiev. As Ukraine prepares for the Euro 2012 football tournament the new stadium in Kiev was opened with great fanfare on October 8. there were 60,000 in attendance with a fireworks show and Shakira performing before the crowd. The president also spoke to the people and welcomed with a mix of boo's and cheers from the crowd. The national colors were on display every where along with past Olympic champions. There was a small accident as the membrane roof was on fire from some fireworks but quickly extinguished. The stadium Olympiskiy was home to the Olympics and reconstructed for the the finals to be help in Kiev Ukraine. There is a spectacular view from the glass mezzanine surrounding the stadium. Do's and dont's of international dating. I will concentrate on Ukraine since most of my recent experience is from there. Do not expect women to fall at your feet because you are American, English ,German or whatever, truth is most would rather stay in Ukraine but will go where the one they love lives. First thing an agency will tell you is the girl will learn English if she is really into you, the truth is she probably will if she really wants to. English is quite difficult to learn but Slavic women have a lot of drive if its something they really want. My advice is save yourself a lot of trouble and find one who speaks a reasonable amount of English. The younger generation will have a small grasp of English since it is given in all the schools in Ukraine. Unless you are famous or wealthy, women more than 10 year your junior are not a good idea, smaller city's have fewer what we call pro daters who just want a free meal and a night on the town. Don't ever get talked into a shopping spree or paying for some sick family member. Agency's will try to make as much money from a client as possible this is the nature of the beast. there are very few that have a reasonable rate, we have a few listed on our links page. Most will charge an introduction fee around 50 dollars is the going rate. interpreters vary by region, Kiev being the most expensive around 15 an hour. In smaller city's such as Sumy Ukraine you can expect to pay 5-7 an hour. If you are still reading this you must have an interest in seeing and meeting some of the most beautiful women in the world. There is basically 3 methods I recommend for meeting that special Ukrainian gem. 1 use an internet site such as Elena's models, we have quite a few listed on our dating pages. It is direct contact no agency involved. 2 finding a few dating agency's in the city or city's you plan to visit in Ukraine. 3 is go and meet them in person but a word of caution her, keep your wits about you. Lets start with flights, check the discount web sites like Kayak. Next you will need a place to stay, renting an apartment is the best option we have a few on our links page who I personally use. Hotels in Ukraine charge at minimum twice what renting an apartment costs. now for transportation. to Kiev you have a few options. bus to metro or taxi. Taxi can cost anywhere from 35-50 dollars if you can negotiate. there is a bus that goes to the train station about ever 20 minutes or so, the metro AKA. subway is next to the train station cost to Kiev from airport about 4 dollars. for other city's expect to pay around 100 dollars for4 hours in a taxi and its best arranged with who you book your apartment with or check our links page. Now for the actual dating part of things. first never give a lady an even number of flowers as it will end the date quickly ( even numbers are bad luck and for the ded). Women expect you to be a gentleman and open door take her wrap and use manners. as for dress code lets face it Americans can be slobs when it comes to the way they dress. business casual or a suit is acceptable.